IT’S BEEN REALLY HARD to tear myself away from the country these mid-autumn days, but return to the big city I must, sometimes. 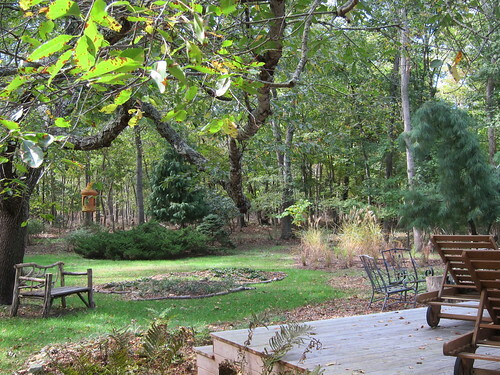 Even though my woodsy part of eastern Long Island, being mostly oaks, is not known for blazing fall color, and though my perennial garden disappointed me in late summer with a paucity of flowers, I’m ending the garden season on a satisfied note. I’m pleased with the slightly staggered arrangement of my six new boxwoods, top, which I supplemented with a conical, five-foot Alberta spruce, named Alberta ($75 on sale and well worth it). It fills a gap and brings in some textural variety. The seven new shrubs are already effective in screening my exquisitely sensitive eyes from the sight of my neighbors’ car and propane tank, even though they’re not full-grown. 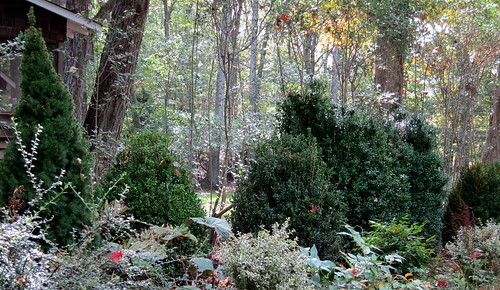 I’ve been coddling them with compost, mulch, and water, and they’ll get a dose of Holly-tone on my next visit. 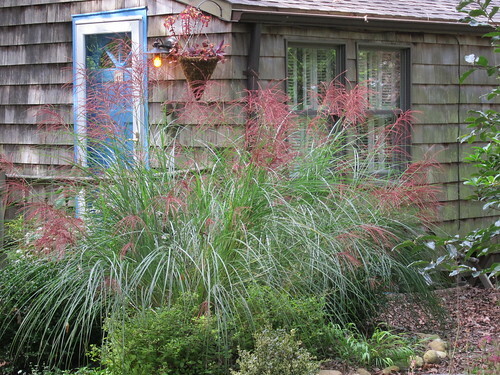 The miscanthus, which my garden-designer friend Lula says is invasive, is indeed rather taking over the sunny bed near my front door, but I’m loving its red plumes. There are two of them there; I’ll move one out in the spring. 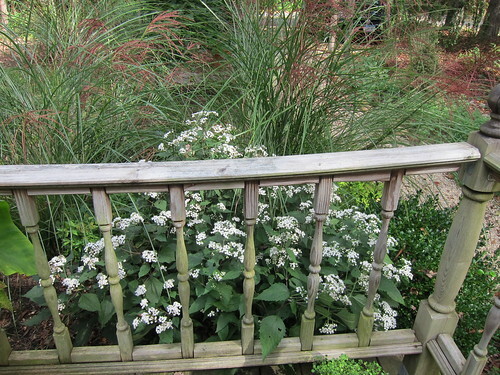 Three cheers for chocolate eupatorium, a Brooklyn stoop sale purchase last spring. Very late-blooming (I thought it might never happen), and such a welcome sight right off the front deck. The wet summer did well by the lawn. It’s full of stuff other than turfgrass, but I don’t care — it’s green. The free-form island bed, which a couple of people suggested I lose in favor of a sweep of lawn, remains. I have planted it up with 54 liriope (yes, ML, the deer nibble it, but they don’t devour it entirely — I have it growing elsewhere — and it’s well-sprayed). My inspiration there is a bed in front of the central branch of the Brooklyn Public Library — nothing but liriope, tidy and impressive. 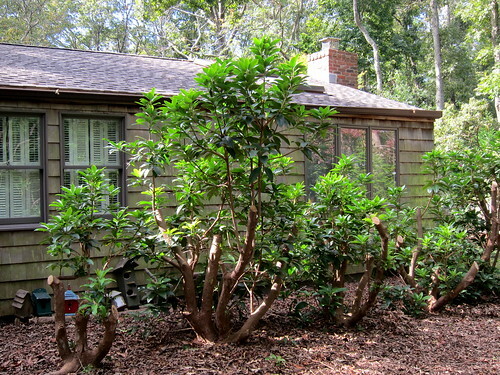 An inexpensive and successful solution to the contorted pine, which I never really liked: moving the three old scraggly azaleas that were situated to its left. They are now in another part of the yard and will be wrapped in burlap to keep the deer from eating them this winter. Meanwhile, the contorta is silhouetted nicely and you can see the newly planted bed of ornamental grasses beyond. I like it much better now. And the rhodies — lookin’ good! They are reveling in the increased air and light they’re receiving since their radical rejuvenation pruning in July, sending up lots of new growth. I’m going to give the overgrown pieris, which I’m guessing could be 40 years old, the same invigorating treatment next spring. So gardening must come to an end soon, but next year promises to be even better. If that isn’t a raison d’etre, or at least a reason to get through the winter, I don’t know what is. 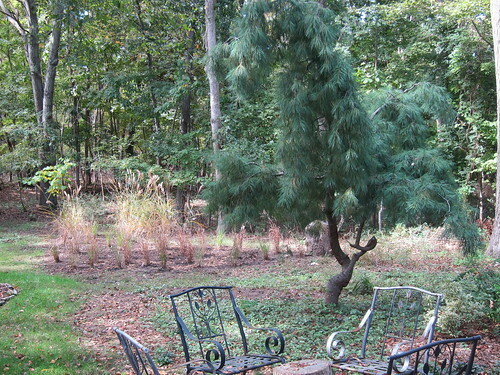 This entry was posted in GARDENS & GARDENING, HAMPTONS, LONG ISLAND and tagged Alberta spruce, boxwoods, chocolate eupatorium, contorted pine, deer, East Hampton, Hollytone, island bed, liriope, miscanthus, pieris, rejuvenation pruning, rhododendrons. Bookmark the permalink. Looks great!!!! Love the new boxwoods! What remarkable changes in such a short time. You have done a remarkable job transforming your property. GLORIOUS INDEED!!!! WONDERFUL CONTRASTS AND COMPOSITIONS!